Audioengine D1 review | What Hi-Fi? The Audioengine D1 is a USB-powered DAC, which makes it truly portable, combined with a headphone amplifier, which makes it even more so. What's more, as well as accepting a signal through the USB input, it also offers the option of an optical connection, which also has the benefit of accepting content of up to 192kHz/24-bit, rather than the USB connection's 92kHz/24-bit limitation. 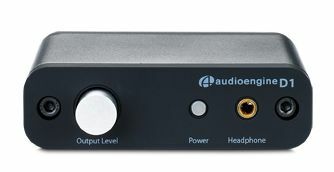 That said, the Audioengine is well-sorted for its primary (USB) function – it will work with both PCs and Macs without the need for any extra drivers on the computer, and comes complete with a 2m USB cable. We prefer the D1's sound via its optical input for its extra refinement, but the differences between the two aren’t massive. Fed a series of uncompressed and high resolution recordings (up to 24Bit/96kHz) the D1 delivers a tonally well balanced and informative sound. There’s a decent dose of dynamic thrust with the likes of Tinie Tempah’s Pass Out and an ability to unravel the busy production without spoiling the music’s message. Move to Tchaikovsky’s 1812 Overture and the Audioengine delivers a good dose of detail. It’s a refined sound without excess hardness, but with enough bite to satisfy. The D1 is happy driving a wide range of headphones – all it lacks sonically is a touch of rhythmic fluidity and a small degree of precision. Still, the D1 remains a fine buy.